I was named Lillian after my maternal grandmother, my Norwegian ancestor. My mother tells me that when they handed me to her upon my birth, she looked down and saw her mother’s face, hence my name. I think I would have been given that name no matter who I looked like, but no matter. My mother loves to tell the story! I’ve written once about my Grandma Lilly’s quilt. I have but a few memories of her including standing next to her in the Slope County farmhouse kitchen while she made sugar cookies, gobbling up the scraps she would hand to me. My Mother tells me that Grandma Lilly could handle any horse. She was an extremely hard worker, both indoors and out as well as exceptionally thrifty. As she would work in her kitchen, she would sing old hymns. She was the rock of the family. When I was born, she gifted my mother with a month of diaper service. The last time I was with her was in the early summer of 1970, when she and I had driven the Ford Galaxy over to the juneberry patch along Deep Creek for an afternoon of picking berries. She let me sit in her ample lap and “drive” on the way home. The next morning, when I awoke, they had taken her to the hospital where she died. My mother’s story of her death is harrowing and I have vivid memories of how broken-hearted my parents were upon her death. She was a much-loved lady in her community and my Grandpa was never the same after losing her. 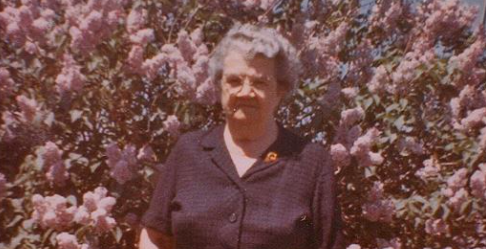 The picture below was taken just before she died, by her lilac bushes in front of the farmhouse. Below is a picture of Lillian and her sister, Anna, when they were cowgirling somewhere south of Miles City, Mont., in the Powder River country, before they were married. It tickles me to no end to see photos of me over the years with that same hands-on-hips stance, even when I was a little girl. I must have picked it up from her when we were living with them the year before we moved to Okinawa. When I was young, I did not like my name. I wanted a more 1960s name, like Tina or Lisa. I never knew anyone else in my age bracket with such an old-fashioned name. Because my Grandma was known as “Lilly,” I was always called “Lillian” to avoid confusion. As I aged, I grew to love my name and embraced the honor of being named after such a beloved lady. Much to my surprise, in the past 20 years, I’ve begun to get compliments about the beauty of the name and I appreciate those and the memories of my Grandma this sparks. When my daughters were young, the singer Emmylou Harris released a song called “Red-Dirt Girl,” which included the lyrics “me and my best friend Lillian.” My daughter, Chelsea,and her pal, Maddy, were just tickled when they heard that line. You can listen to it here. Some years later, Jim and I were at the Telluride Bluegrass Festival with some pals and Emmylou was one of the performers. Lo and behold, she sang “Red-Dirt Girl!” When it was announced that she would be signing after her set, I was first in line. I told Emmylou my name and she said I just had to come behind the table for a photo with her. She also signed the hat that I was wearing. How cool is that? Thank you, Grandma Lilly. “Lillian” is definitely making a comeback. I see and read about little girls named Lillian all the time–including one of my own grand-nieces, who is 4.